In 1974, a time when there where only a few sailors on the lake, a meeting was held to form Lake Conroe Racing and Cruising Association (LCRCA). These sailors met every chance they could, cruising and learning to race with the ultimate goal being to one day have their own facility. The day came in 1980, when some afordable property was offered for sale on the lake. But to everyone’s dismay, all were not ready to put their money on the table and the deal slipped away. The following year the present property became available, and through the efforts of a few sailors a partnership was formed to develop River Road Yacht Club, (whose name was later changed to Conroe Yacht Club). Eventually all former LCRCA members joined, and we continue today with our original racing and cruising. Huricane Alicia destroyed the marina in 1983. The marina was re-build and a breakwater was installed in 1984. During an expansion program in 1988, the marina was expanded to its current layout and the dry storage area was developed. 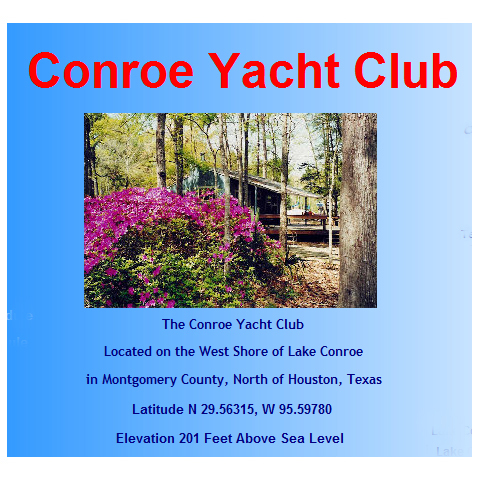 Conroe Yacht Club is more than a facility, we are a family. Our members run the club, and decide who, what, where, when, and how. The main attraction for the average boat owner is a place to work on their boat. A place to store more than one boat ( the second at a reduced rate). A place to sit amongst the trees on a hot day. A place to bring your family and friends. A place to relax and get away from it all.